What benefited the viewing of this film for me, was the fact that I hadn’t read a single shred of information on it. I knew nothing more then its basic premise and who was in it. I did not read a single review save for the snippets they highlight in the TV spots. I recommend that if you haven’t seen the film, to stop reading this review. 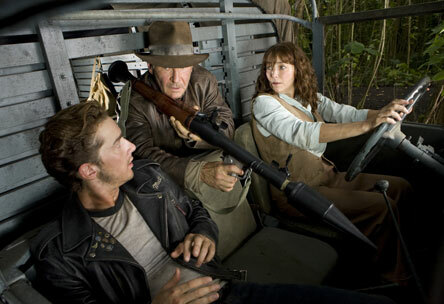 Just remember one thing before you go, this is an Indiana Jones film, a fun, entertaining flick. They’ve always been slightly far fetched, because it’s a popcorn movie for goddsakes! All right, go watch the movie, then come back and read the rest of my article. For those of you who are still with me (even you, who didn’t heed my advice, don’t worry I won’t spoil anything), ‘Indiana Jones and the Kingdom of the Crystal Skull,’ is the first Indiana Jones film in 19 years. ‘Indiana Jones’ is my sacred movie hero, I grew up on him, my entire interest in film grew out of these films. When word reached that the fourth one finally was going to get the green light, two feelings hit me. One of happiness, this would be a dream come true, a brand new Indiana Jones film, and I’d be old enough to see it in theater. The second, was of fear, what if it didn’t live up to its expectation? In this film, Indiana Jones is recruited by a young greaser by the name of Mutt Williams (Shia LaBeouf), to help save his mother Mary, and Harold Oxley (John Hurt), a former colleague of Dr. Jones. We learn that Oxley was after a legendary crystal skull that holds the power to give unspeakable power to the person who returns it to where it came from. To answer the first question I’m sure you have, “Is it as good as the first three films?” I’d say, Raiders, is clearly the best film of the three, next would be Last Crusade, and third, Kingdom of the Crystal Skull. For a movie that runs two hours, the pacing is quite fast, a bit too fast in fact. Mutt and Indy just barely connect, and, when Marion (Karen Allen) is revealed to be Mutt’s mother, there is no conflict for Indy’s absence from her life. However, other then this fast pace and lack of development in the characters relationships, there was very little about the film that bothered me. There are a few scenes that stand out in the cheese factor, but again, forgivable because of the light hearted fun in it all (Let’s be realistic, I don’t think you can jump out of a plane on a life raft a la ‘Temple of Doom’ and come out unscathed). Perhaps what made the previous implausibilities so convincing were the lack of CG graphics in the execution, but, its a different business now. I will say there is much less CGI in the film then I thought there’d be. They definitely used it sparingly. That said, the few ‘Lucasisms’ that do pop up are irritating, but their over before you know it, so don’t worry. 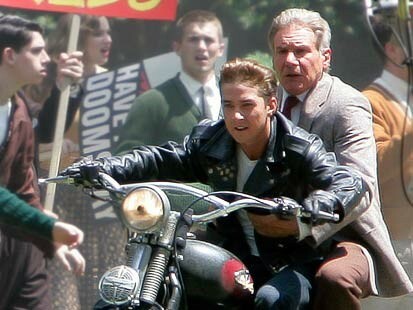 Harrison Ford looked excellent, a little older, a little grayer, but he was back. There is something about him that just doesn’t feel 100%, but enough of him is there so it doesn’t effect it. And all you whinin’ fanboys can shut your yap, Shia rules. The film looks great on DVD, and despite a few cringe moments, is still not bad on a second viewing. The special features are a bit sparse and feel a bit like “we just stuck this on there because we had to.” I did enjoy watching Spielberg talk about how many times Lucas and Ford approached him to do another film, and how he was the sole hold out. If you’re a fan and own the rest of the series, you’d be crazy not to pick this one up! Adventure is back, and its name, is Indiana Jones.